The Coast Guard, and good Samaritans rescued six fishermen from the 57-foot fishing vessel, Jane, reportedly taking on water 110 miles southeast of the Big Island of Hawaiʻi on Monday, Nov. 27, 2017. The six fishermen were rescued by the crew of the 70-foot fishing vessel VAK 2 and are en route to Hawaiʻi, where they will be met by emergency medical services and U.S. Customs and Border Protection. At 7:22 a.m., watchstanders at the Sector Honolulu command center received a mayday call via satellite phone from one of the crewmembers aboard the Jane stating they were taking on water and in need of immediate assistance. Sector Honolulu watchstanders issued an Urgent Marine Information Broadcast notice to mariners and requested the assistance of the VAK 2 crew, five miles away from the scene. At 7:40 a.m., an HC-130 Hercules aircrew and an MH-65 Dolphin helicopter from Coast Guard Air Station Barbers Point launched to the scene along with the crew of the U.S. Coast Guard Cutter Kittiwake (WPB 87316), an 87-foot coastal patrol boat homeported in Honolulu. The Hercules aircrew arrived on scene at 9:40 a.m. They quickly located the fishing vessel overturned and a life raft with all six of the crew inside 100 yards away. Weather on scene was reported as 14-foot seas, 34 mph winds and scattered thunderstorms. The Coast Guard issued a broadcast notice to mariners advising mariner in the area of the possible hazard to navigation posed by the overturned fishing vessel. The cause of incident is under investigation. 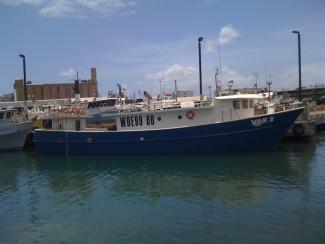 The Jane and the VAK 2 are reportedly tuna longliners homeported in Honolulu.